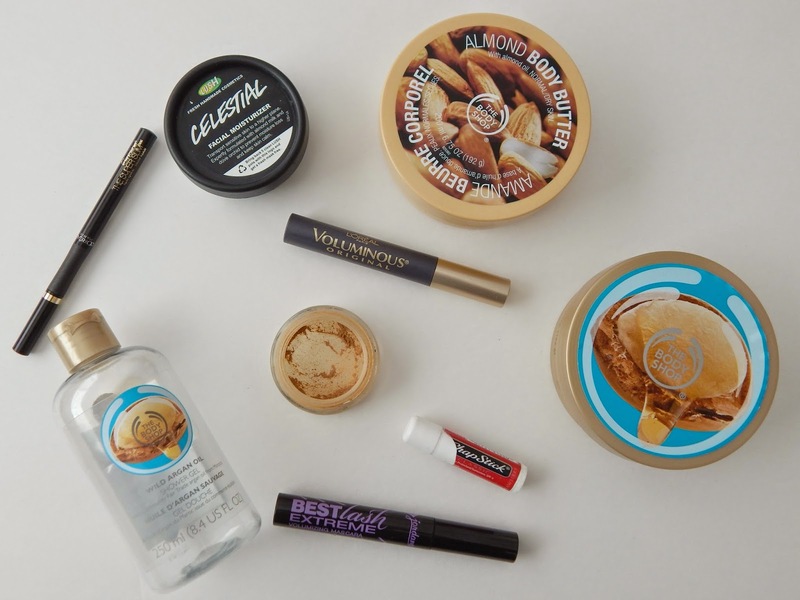 been wanting to do this post for a while and now that i have some empty products laying around (such a weird feeling not throwing your trash away including one incident where i did and i dove right back into that trashcan to retrieve it! )i will give it a go. The Body Shop Wild Argan Oil Body Butter- this stuff saved my dry skin this past December. it has an interesting consistency which reminds me of lard, but not in a bad way. it's just thicker and applies so nicely to your skin. it literally melts in. i am not wild about the scent at all though. it is a bit old lady to me but i can deal with it. i would repurchase this item again but only during the winter. The Body Shop Almond Body Butter- loved this product! it is very hydrating, but not as intense as the Wild Argan Oil Body Butter, but it did help keep my skin hydrated. the scent is great. it's not too overpowering but leaves the skin smelling nice. i would definitely purchase this again. also, if you live in hotter climates like i do, i do think you could use this year round. The Body Shop Wild Argan Oil Shower Gel- this in combo with the body butter was a God send. i normally have a reaction to shower gel that has too much scent in it and while this gel did have some kick to it, it wasn't overpowering. it left my skin feeling soft and smooth after i had dried off. of course then i slathered on the body butter. again, i would repurchase this item but only until next winter. Lush Celestial Moisturizer- i have previously raved about this product here and i have to say this product alone changed my skin care. i have NEVER been able to use moisturizer on my face. everything broke me out. but as i got older i knew i needed something. this stuff not only solved my dry skin issues but made those hard bumps under my skin come to the surface and then completely disappear. seriously a skin savor! it is constantly sold out at my Lush store so that means something. as soon as they have it again, i will be getting it! Chapstick- i mentioned in this post how i normally have the mint version of this in my makeup bag but for as long as i can remember (i mean childhood guys. i used to think this was lipstick) i have always had a tube of this laying around. and when i mean 'a' i mean like 5. i don't see anything wow about this product mainly i just wanted to finish it and get some kind of medal. will i buy it again? i mean i can't say i wont but i want to make a conscious effort not to and to invest in something a little bit more moisturizing. L'Oreal The Super Slim Liquid Eyeliner- i mentioned this in my favorite eyeliner post and i continue to love this product. so easy to use. very pigmented and lasts as long as your makeup is on! i will be buying this again. Jordana Best Lash Extreme- this is interesting for me. i had used a tube of this mascara this past summer and absolutely loved it! i mean to the point of i had seriously thought about replacing my one and only true love L'Oreal Voluminous Mascara in Carbon Black. so i finished it off and went through about 3 tubes of my regular mascara and then picked another one of these up. they are a bit hard to find where i live so i was pretty excited when i found a random store that had a counter. i promptly began to use it and the results were less than desirable. my eyelashes looked like i had stuck my finger in a electric socket. i mean they literally bent at the ends in odd angels. i continued to use it not wanting to be wasteful and the formula did not get any better. finally i just gave up. i think eventually i will pick up a tube and see if maybe the one i got was old but i am in no rush to do so. L'Oreal Voluminous Mascara in Purple- i think this was a limited release for the summer as i have yet to see them again. the formula wasn't as thick as the original but gave a good separation and of course volume to my lashes. the color was subtle but did bring out the undertones in my eyes and just made them look a little more present. no one noticed that i was wearing colored mascara during that time just to give you an idea of how vivid the color was. Maybelline Dream Matte Mouse- if you have been reading my blog you will know that i already repurchased this item. it is great. it gives such a natural matte finish without seeming cakey or dry. plus this photographs wonderfully with no 'white face'. the color matches me perfectly as well. seriously try it out if you haven't already. it is more of a medium to full coverage foundation. perfect for a night out on the town. i hope these 'after use' reviews help you guys out and as always i would love to hear from you. comment below or tweet me @lifeinmascara and tell me what you are loving right now!